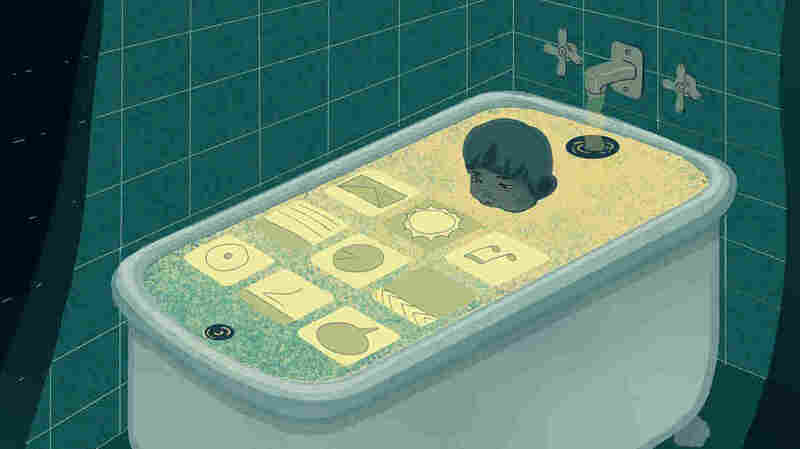 Deciding At What Age To Give A Kid A Smartphone : NPR Ed It's a question most parents will wrestle with at some point — when is the right time to give my child a smartphone? Let's tick through a few other questions first. It's the time of year when kids are thinking about their holiday wish lists. So what's a parent to do when a child, possibly a very young child, asks for a smartphone? We hear that smartphones can be addictive, that screen time can hurt learning, but can't these minicomputers also teach kids about responsibility and put educational apps at their tiny fingertips? To learn more, let's look at two families: one where smartphones are allowed for elementary to middle school-aged kids, and one where they are not. Sydney Crowe is in sixth grade and has a smartphone. While she admits she mostly uses it for "playing games and watching television," her mom, Patty, says that's not why Sydney got the phone. Patty's main concern was safety. When Syndey was in fourth grade, the bus missed her stop enough times to really worry her parents. Without means to call an adult, she would walk to school near a busy highway. That's when Patty gave her daughter a flip phone. But Sydney never charged it — she forgot about it. To her, a flip phone wasn't fun. "She wasn't using the junky phone," says Patty. So when her husband wanted to upgrade his iPhone, they decided to give the old one to Sydney as a hand-me-down. Patty says she rolled her eyes at the idea of her child having a smartphone, but ultimately decided to allow it for one main reason: peace of mind. On the other side of the debate, there's Mercy Shannon. She's 9 years old and doesn't have a cellphone. She likes playing house, playing outside and singing on her karaoke machine. Mercy's mom, Brooke Shannon, like many other parents of elementary school kids, faced the cellphone decision early on. "They started asking for a phone in first grade," she says about her kids. Brooke felt pressure from her children, yes, but also from other parents. So she started an online pledge that she calls "Wait Until 8th" to create a community of parents within each school waiting to give their kids smartphones until at least eighth grade — when most children are out of elementary and nearing high school. So far, more than 4,000 families across the country have signed the online pledge. In addition to wanting her kids to have a break from screens, Brooke worries about the effects, specifically, of social media. That isn't just a parent concern. Richard Freed, a California-based child psychologist and author of a book on the subject, wanted to research the topic after seeing an increase in the number of children coming to him with anxiety and depression. His suggestion? Put some ground rules in place. "I want parents to understand how remarkably powerful and seductive these technologies are," he says. Will they follow rules around phone use? And do kids need to be in touch for safety reasons? If so, will an old-fashioned flip phone (like the one Sydney never charged) do the trick?